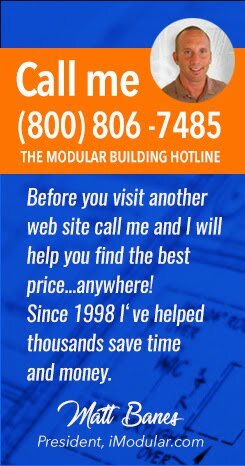 Select the best site location for your modular building. Modular building is amazingly fast when compared to conventional construction but there are some location based "hurdles" that need to be considered in the early stages of your modular facility planning to avoid costly delays. Modular buildings are manufactured in sections and delivered to your site by experienced transporters using specialized trucks. The modular sections are then offloaded either by unhitching or by using a large forklift or crane. This process requires plenty of space for the trucks, heavy equipment and manpower to jockey each "module" into place and onto the foundation before interconnection and close up take place. The installation process moves quickly and can be very smooth barring weather delays so watch your local forecast and try to plan accordingly. 1. Select your modular building site carefully by considering ease of access / exit for trucks, heavy equipment and manpower. 2. Choosing a site location with easy access will save you time and money by avoiding the need for heavy installation equipment or removal of existing structures to clear a path of travel for delivery and installation. 3. If you have no options but to utilize a difficult site don't worry - the modular builders have very experienced teams to handle the most complex site installations. It's just more costly than the opposite scenario. Most importantly, site selection also involves understanding what your local building authorities will permit and what the Fire Marshall will want you to do in order to meet requirements in the event of an emergency. Sometimes meeting these requirements is either physically impossible or just not in your budget so it's smart to develop a few site options and discuss these with the authorities before spending too much time and money in the planning stage.